Why choose us to render? We take great pride in our structured approach to the design, installation and maintenance of building facades. Our experienced management team utilise their broad industry knowledge to ensure outstanding results on each project. We provide an excellent finish and take great pride in our customer relationships, offering a professional and reliable service. We work with a number of different systems to create a variety of surface finishes. We are able to accommodate any detail or requirement. Please look through our website to view the variety of different finishes we offer and take a look at the manufacturers systems we work with. Our management team has vast experience running large commercial plaster works as well, undertaking some of the largest jobs in Scotland. Our tried and tested methods allow for the smooth process of successfully completing large scale works. 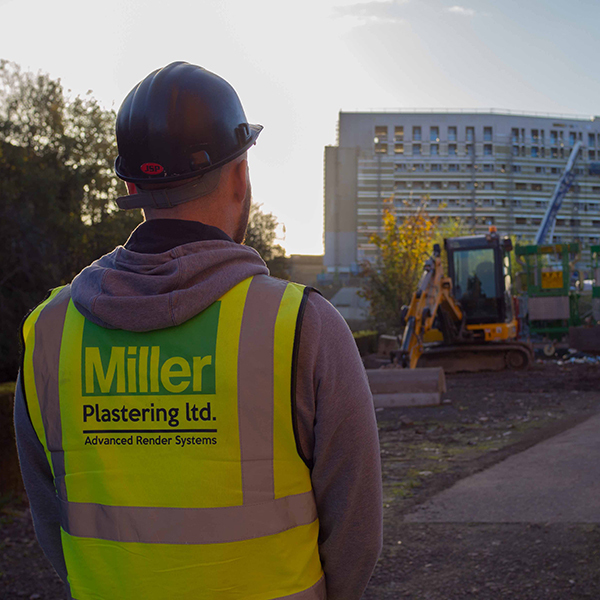 Miller Plastering Ltd. commenced business in 1989 with our sole focus on plastering. Over the years our repertoire has developed and we now also specialise in render façades, insulation and cladding solutions. In addition, we undertake building contract works if the right projects present themselves. We are approved or recommended installers of all major manufacturer render systems. Our workforce is fully qualified and experienced in their profession, while having the necessary CSCS qualifications. The company is registered through Constructionline. Our company is compliant with Citation health & safety procedures. In addition we are a member of Safety Schemes in Procurment (SSIP) provided via National Accreditation Scheme for Safety & Health (NASSH) Envirotec. We have a variety of render spray machines that we allocate depending on specifications of each project. This offers us an advantage over traditional methods as there is a reduction in labour requirements and scaffold time, making the process more cost efficient whilst offering a superior product. External render on your house offers the advantage of being waterproof, coloured through and more flexible than traditional sand and cement. This is aesthetically pleasing as well as more suitable for British weather. There are a huge amount of colours available and many different modern finishes. Moreover, we offer a maintenance package for your render and have access to silicone and mastic specialists so as to best protect your rendered building.